Common snapping turtles and alligator snapping turtles belong to two different genera in the family chelydrdae. This family consists of just three species known as either snapping or big-head turtles. The two snapping turtles have a number of physical similarities and resemble each other superficially, but they also have a number of differences. 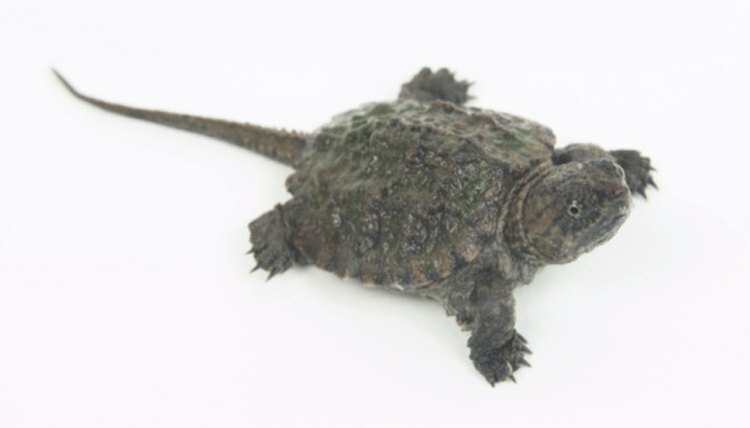 The two varieties of snapping turtle both look like prehistoric reptiles with long, pointed tails, a spiny-looking shell and a large snapping mouth. The alligator snapping turtle is a lot larger than the common variety. It grows to between 31 and 39 inches in length, compared with the common's 7 to 17 inches. The alligator snapping turtle is much heavier at up to 176 lbs., compared with 35 lbs. for the common variety. The alligator variety also has its eyes on the side of its head, while other snapping turtles have forward-pointing eyes. The alligator snapping turtle lives in the southeastern U.S. from Florida to southern Georgia, west into Texas and north into parts of Illinois. The common snapping turtle has a more northwestern range from Alberta, Canada, to Nova Scotia, south through Texas and into parts of Mexico. The alligator variety lives solely in freshwater habitats such as rivers, lakes and ponds. It prefers the deeper water sources in its range. The common snapping turtle is also a freshwater species but can tolerate more brackish environments such as salt marshes or swamps near coastal areas. Snapping turtles are aggressive hunters, using powerful jaws to catch and quickly kill prey. The common snapping turtle is omnivorous and eats aquatic plants as well as fish, birds, mammals and amphibians. The alligator snapping turtle is more carnivorous, feeding on a wide range of animals, and with its added size often consuming larger animals than the common snapping turtle eats. It does eat small amounts of aquatic vegetation as well as nuts, tubers and tree bark. When fully grown, only humans pose any real threat to either species, but eggs and young turtles may be eaten by birds, snakes and predatory fish. Snapping turtles are solitary animals, meeting up only to mate or fight over territory. The common snapping turtle mates between April and November, while the alligator snapping turtle breeds during early to late spring, depending on the region. Both species dig out nests in which to lay eggs, with the common variety producing up to 80 and the alligator snapping turtle laying around 50 eggs. Common snapping turtle eggs take nine to 18 weeks to hatch, while alligator snapping turtle eggs require 14 to 20 weeks. Neither species provides care for the young once eggs are laid. The alligator snapping turtle lives up to 45 years in the wild, compared with the common variety's 30 years. University of Michigan Museum of Zoology; Macrochelys temminckii; Matt Nichols, et al. What Is the Most Common Turtle?